Can Can Culinary Cabaret! Seattle’s very own world class theatre is proud to announce its all new FAMILY-FRIENDLY show Bonbon Brunch! The show celebrates all that glitters with a contemporary twist on classic cabaret and features a cast of highly athletic dancers and show stopping singers. Prepare to leave the outside world behind as you sit nestled underneath the historic Pike Place Market in a cozy theatre setting sipping mimosas and dining on a market fresh brunch menu. Your hilarious host Sensible Paul will guide you through a multimedia spectacle of exquisitely choreographed dance set upon a backdrop of all-new high definition visual content. 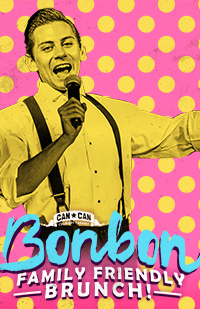 Bonbon Brunch is the buttoned up and family-friendly version of Can Can’s world famous dinner shows and promises an unforgettably funny and sparkly spectacle of dance, song, and laughter for all ages to enjoy. Bonbon Brunch is the culmination of over a decade of collaboration among the company's long-time-creative-team Chris Pink (Founder / Artistic Director), Fae Phalen Pink (Choreographer), Jonathan Betchtel (Production Manager / Principal Dancer and Host), and Tj Davis (Scenic Projection Designer). Due to the nature of our ticketing, General Admission parties of 6+, and all VIP and Preferred tickets will have a 20% gratuity added to the check. By purchasing your tickets you are agreeing to this charge.